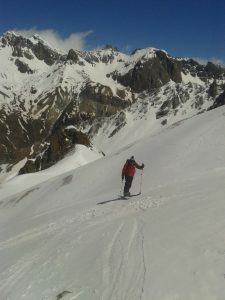 Just to the south of the Col du Lautaret, the Combeynot range offers a range of interesting ski tours of differing lengths and difficulties. 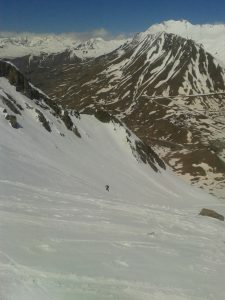 The high starting point (2057m) at the Lautaret means that it is possible to ski back to the road on north facing slopes, even late in the season. On Wednesday (27th April) we headed towards the Pic Ouest de Combeynot (3155m) which stands guard at the head of the Vallon bearing its name. The route heads south from the Col du Lautaret, initially up steep but wide open slopes to a flat area around 2600m just above the top of the Gros Ane – a large rock outcrop with a pleasant little couloir in its north face. Above the flat the route follows the left bank of the Combeynot glacier which funnels into a steep gully where it was time to take the skis off and bootpack. This leads onto a shoulder at 3000m which for us was the end of the climb. Beyond that a steep slope leads 100m higher to the summit ridge and a final 50m of ascent on foot. Sadly snow conditions were not amenable with heavy windslab accumulations close to the summit ridge. 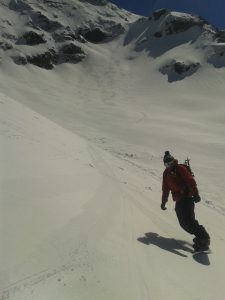 Despite not ticking a summit the ski down was very enjoyable with a detour to the east of the Gros Ane giving softer snow conditions for the descent.